15/10/12 - Acquisitions - Dijon, Musée des Beaux-Arts - A rather mediocre painter, François Devosge, born in Dijon, has gone down in history as the founder of the Ecole de Dessin in this city and the many talented students he trained there. Among these, (besides François Rude and Pierre-Paul Prud’hon) Benigne Gagneraux and Jean-Claude Naigeon clearly stand out. 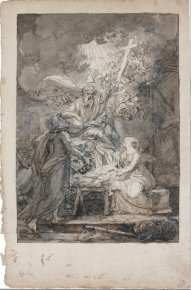 The Musée des Beaux-Arts in Dijon has recently enriched its collections with a painting by the first and several drawings by the second. Acquired from the Hubert Duchemin gallery in Paris , the Gagneraux canvas was until now totally unpublished (ill. 1). 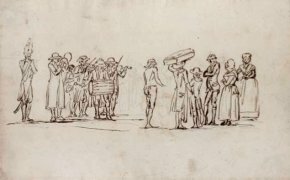 It reveals all the skill of this artist who died prematurely : cold and metallic colors, a taste for a Neo-Classic, linear drawing inspired notably by John Flaxman (but tempered here by a Neo-Baroque verve found in other paintings and recalling the same subject treated by Rubens) ; a determined indifference to proportions, all of the figures (horses, riders, lion) appear to be the same size ; a gracefulness (the protagonists seem to be almost dancing) which Sylvain Laveissière opposes to "David’s pure and severe Neo-Classicism" as we wrote recently ; finally, a Poussin influence, more obvious in other paintings (such as Clorinde’s Baptism at the Louvre) which here, shows notably in the landscape. After obtaining the Premier prix de Rome awarded by the Etats de Bourgogne in 1776, the artist left for the Eternal City. His short career was spent in Italy and he died in Florence in 1795. This Lion Hunt is in fact a version of another canvas commissioned that very year by the Grand Duke of Tuscany and sent to Pistoia where it disappeared during WWII. The work purchased by Dijon appears to be, according to the theory suggested by Sylvain Laveissière, the specialist on Gagnereaux who staged a retrospective on him in 1983 , the first one painted by the artist who was apparently not pleased with the results given the many pentimenti seen on it. He therefore produced a second version for the Grand Duke. There are some known signed replicas of this composition, one residing in a private collection in Stockholm and other smaller formats which have come up at auction in the last few years. 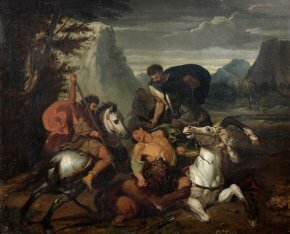 The Lion Hunt, still presenting its original canvas, will be restored at the C2MRF (re-fixing and cleaning, removal of an awkward old pentimento and restoration of the frame) before going on view at the Musée des Beaux-Arts. We had already pointed out here the exhibition at the Galerie Nathalie Motte Masselinck presenting the drawings of Jean-Claude Naigeon which prompted his rediscovery. We also wrote that a museum in the provinces had acquired twelve of these but could not speak any further. 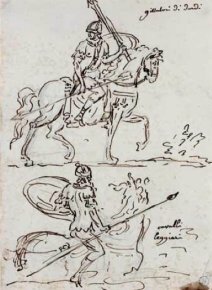 It was in fact Dijon which bought the following sheets, all representative of the artist, from perfectly completed works to initial sketches, ranging from historical scenes to academic nudes, including also landscapes and a caricature. The Holy Family with God the Father (ill. 2) : Naigeon exhibited this subject three times at the Salon de Dijon. On the back of this drawing, there is a preparatory drawing for the Virgin. 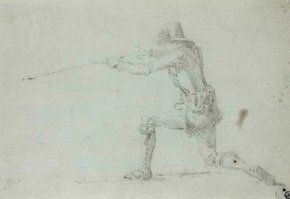 A Soldier Stabs an Adversary in the Neck with a Javelin (ill. 3) ; the subject has not been identified. 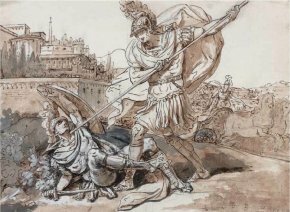 According to the catalogue published by the Galerie Motte Masselinck, it might be The Death of Turnus evoked by Virgil in Canto XII of the Aeneid. 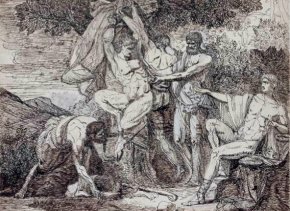 The Flaying of Marsyas (ill. 4). Two academic male nudes (ill. 5) : nothing is known about whether these two nudes were produced when Naigeon was a student or else a professor. 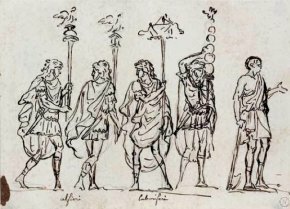 Roman Standard Bearers and Workers and Roman Soldiers on Horseback (ill. 6 and 7) : these are drawings based on the reliefs on Trajan’s column, probably produced from casts or engravings. 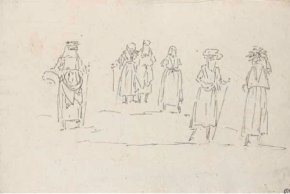 Italian Peasant Women and A Scene from a Village in Burgundy (ill. 8 and 9). 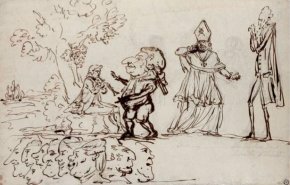 A Hunter (ill. 10) and Caricature of the Nobility and the Clergy (ill. 11) : this caricature bears the inscription abbot leaving the National Assembly idem. The figure with the hooked nose might be either Louis XVI or else Prince de Bourbon-Condé. A View of the Interior of the Temple of Vesta and La Piazza della Signoria, Florence (ill. 12 and 13) : Naigeon spent more than four years in Rome starting in 1780. 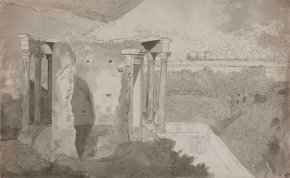 He produced many landscape drawings there including this view of the Temple of Vesta at the Roman Forum. 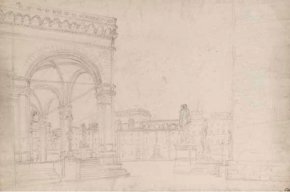 The drawing representing the Piazza della Signoria in Florence proves the artist was in the city, probably around May-June 1785 when returning from Rome. We would like to thank Matthieu Gilles for pointing out this acquisition and providing the background elements on it. Bénigne Gagneraux (1756-1795), un peintre bourguignon dans la Rome néo-classique, catalogue by Sylvain Laveissière, Birgitta Sandström, Paola Hoffman and Sara Staccioli, Rome, 1983.